Two very different Frank Lloyd Wright projects celebrate their centennial this year. Milwaukee native Barbara Elsner is well acquainted with both. 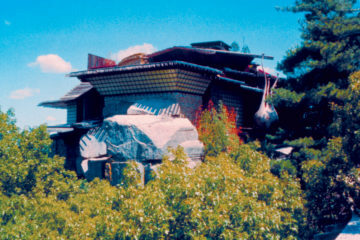 Barbara Elsner didn’t set out to buy a Frank Lloyd Wright house. In 1955, she and her husband, Bob, needed more space for their growing family, so they purchased a spacious two-story home on Milwaukee’s East Side designed by Wright for Frederick C. Bogk, a businessman and city alderman. “I had to learn just what had we bought,” says Elsner, who happened across a decorating magazine that had done a Wright-themed issue. A corner of the Bogk house living room features tall, narrow windows, built-in bookshelves and signature Wright brickwork. Photo by Will Skaggs. The Bogk house was built precisely 100 years ago, in 1916, when the architect was 49 years old and at a crossroads in his career. He had left his wife, and his mistress had only recently been murdered in a brutal killing spree. Commissions for the architect had become scarce, yet this is also the year that six of Wright’s American System-Built Homes, two bungalows and four duplexes, were built on West Burnham Street on the South Side. “I think he was at his prime,” says Elsner of Wright’s work during this period. “This house isn’t revolutionary in big ways,” says Elsner about the Bogk house, which she and Bob still own. “But all the details make it special.” These include built-in furnishings: bookshelves, a table and a couch in the living room and cabinets in the dining room. Broad passageways connect different areas of the house. “He was trying to get rid of halls,” she says. When Wright was still alive, Bob Elsner wrote to him asking if he had a plan for the home’s landscaping. The architect responded that it was a good house with a good client and instructed the family to buy furniture from the line he had designed. Barbara Elsner in the living room of the Bogk house. Photo by Will Skaggs. Over the years, Elsner’s interest in and knowledge of Wright grew, and she eventually became a board member of Frank Lloyd Wright Wisconsin, a nonprofit preservation group that, in 2004, acquired and began the restoration of one of the Burnham Street bungalows. The organization later bought the other bungalow and two of the duplexes, none of which has yet been fully restored. Designed as “quality housing for modest-income buyers,” all the wood and other materials for American System-Built Homes were cut before arriving at construction sites, helping keep costs down. Wright’s aesthetic is distilled to its essence in the restored bungalow, which is open to the public. The architect incorporated 33 windows into a mere 800-square-foot floor plan, imbuing it with the same abundance of light as the much larger Bogk house. It also features built-in furniture, including a pull-out dining table, and a wide passage that connects the two bedrooms and bathroom. Having spent most of her life in the Bogk house, Elsner finds it hard to speculate how living in a Wright design has shaped her, other than to say it’s brought the world to her door: “I have met a lot of interesting, amazing people,” she says. ‘Wright Now’ appears in the July issue of Milwaukee Magazine.